This year, ROCS students began studying Japanese language and culture with Meridith Kiyosue. Meridith's work is cross-disciplinary, engaging, and enables our students to think of themselves as citizens of a world in new and interesting ways. This post is based on her class notes from August 23 through September 29, 2017. The first week of school, Meridith spent time measuring the students' comfort levels and exploring their interests and prior knowledge to identify ways to engage them in learning that would be relevant and meaningful to them. Together they discovered small connections to Japan they experience in their daily lives including martial arts, origami, an interest in ninjas, a love of sushi, and video games. 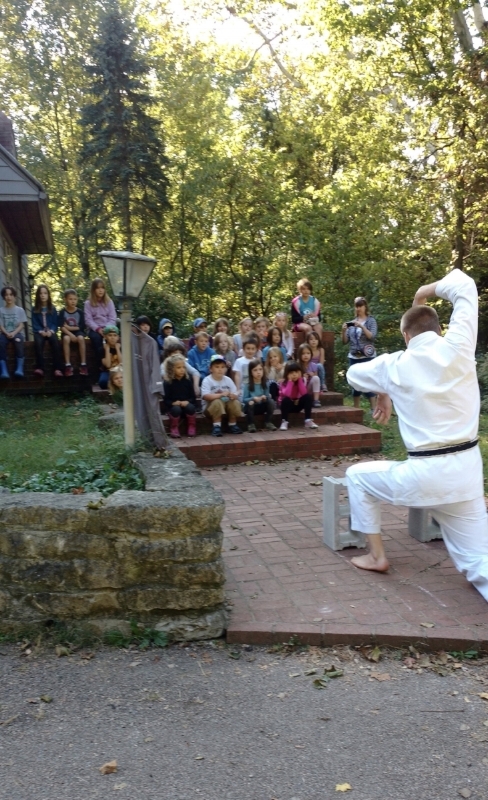 In the first few weeks of school, Meridith led the students through a study of ninjas. They learned the origins and evolution of the ways of the ninja over time. Drawing from the book Ninja: 1,000 Years of the Shadow Warrior by John Man, they learned how ninjas began as farmers defending their villages in war-torn Japan nearly 700 years ago. Meridith and Maureen introduced the concept of correct mind required first and foremost of all ninjas. Correct mind includes: being responsible, remaining calm & peaceful, being flexible and shugyo (training like crazy or persevering). As their studies continues, students used a simple embossing technique with aluminum foil and dried leaves to made a tsuba or hand guard for a sword. Some students currently practicing martial arts shared their skills with the students. And they colored paper ninjas complete with common tools and items ninjas historically carried. Students labeled parts of the ninja atama, kata, hiza, ashi (head, shoulders, knees and toes), practicing more new vocabulary, which they could practice using an already familiar children's song. All students enjoyed the dramatic storytelling of "How a Ninja Grows from a Single Bamboo Sprout", a well-known ninja legend in Japan. The story introduced more new vocabulary including ta-ke, jishin, ame, kaze, kaminari, and yuki (bamboo, earthquake, rain, wind, thunder & lightning, and snow). This past week, Sensei Dan Rotnem, the uncle of two of our students, visited ROCS. Sensei Dan, as the students call him, introduced himself with a palm strike, breaking a concrete concrete block with one swift action. After getting our attention in a big way, Sensei Dan went on to explain the meaning of the kanji characters of "ninja" (忍者) : one who endures via perfect practice every day. The students used their prior knowledge to answer questions on mindfulness, real ninjas, and to count to ten in Japanese. 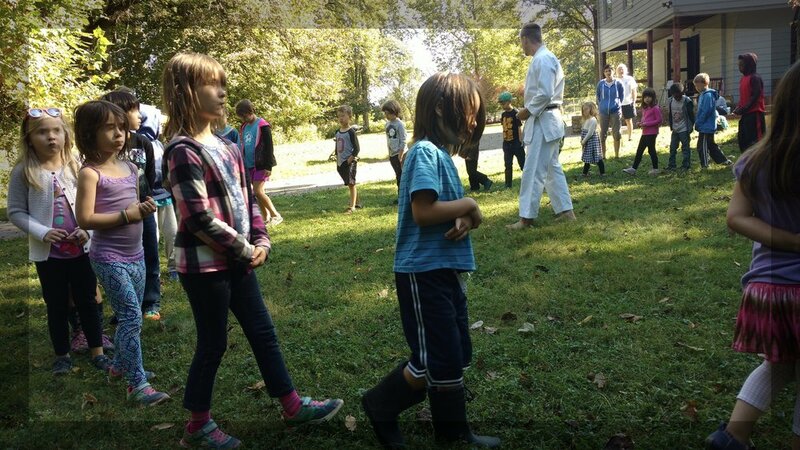 Next, Sensei Dan led the students on a Zen meditation walk where they practiced being in the moment, listening to the ambient sounds, and feeling the breeze on their skin. He spoke of a circle having no beginning and no end, and how there is always someone ahead of you from whom you can learn, and someone behind you whom you can help. The goal is being mindful of others and less focused on the self. Next, Dan got the students moving with some karate forms including the 騎馬立ち - horse stance from which we learned the basic punch, followed by a complimentary block (外腕受け - outside forearm block). Not only was this unit interdisciplinary, it impacted students intellectual, social-emotion, and physical development. We look forward to seeing what Meridith will explore next with the students!